In her early twenties, Rachel Hard moved to the UK for two years and had the opportunity to work for an NGO running a range of community programs and support services. In this time she experienced work in a homeless hostel, women’s refuge, drop-in-centre, supported youth accommodation and a disability care home. Working with such diverse clients had a profound and lasting effect on Rachel, fuelling her passion to help those experiencing distress or having difficulties engaging in the community in meaningful ways. 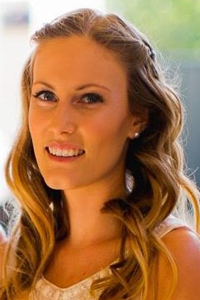 Upon her return to Australia, Rachel completed her Postgraduate Diploma in Psychology via distance education and is now giving back to her community through her work with a local NGO. Read more about Rachel’s journey. I’m currently... employed as a psychologist with provisional registration at a local NGO. I have worked in the for-profit sector previously in the health care industry, and realised that my focus will never be about profit; rather my focus is on client outcome. Often those individuals who need the most support are those least able to access it. My childhood was... wonderful. I come from a large, supportive family who have always encouraged me. I was the first in my immediate family to attend university, which was an immensely proud moment for me and my family. As a child, I was most curious about... personality. How each person’s body has the same physical structures yet we are all individuals. I chose CSU because... of the ability to undertake my studies as an external student. I need to work full-time so completing my studies at CSU allowed me to remain employed and engage in flexible study options. My best experience at CSU... was attending the residential schools and utilising the state-of-the-art teaching hospital. We utilised one of the rooms with microphones, headphones and recording equipment to engage in feedback sessions pertaining to the development of our counselling skills. The most difficult thing was the distance I had to travel from Western Australia for each residential school. At university I was inspired by... my lecturers and mature age students. Each individual brought personal, life experience as well as many with professional experience which I found fascinating. Today I’m motivated... to continue giving back to my community and seeking engagement with those who experience difficulty attending or affording mental health services. In my profession it is important to... remain open, be non-judgmental and be empathetic. I never dreamed I would... be able to find a job where I am offered the opportunity to receive professional supervision that allows me to complete my registration as a psychologist as positions are so scarce and competitive. The biggest influence in my life... would be my mother. She taught me about work ethic, honesty and ambition. I’m most proud... of moving out of home age 21 to the United Kingdom where I lived for two years before returning to Australia. I very much enjoyed the independence and knowing that I was capable of making my own way in the world. My greatest achievement... is completing my studies in psychology and working towards registration as a psychologist. In the future... I’d like to run my own business. The topic I tweet about most is... nothing. I don’t tweet. I think there is far too much screen based communication. We are people and thrive on face-to-face, direct connection so in order to practice what I preach to clients, I keep my own digital footprint as small as I can. I truly believe... that those who are fortunate enough to have the capacity to help should help. If I could do it all again... I would!